Speech by Iraklis Tsavdaridis, Executive Secretary of the World Peace Council, to the Counter-Summit for Peace & Economic Justice aganst NATO and the G8. Allow me to thank the US Peace Council for the invitation to be here with you in Chicago, a city which marked the history of the workers’ movement in the history. We salute the millions of peace loving people in the USA, the working people and all poor and oppressed in this center of imperialism. On the occasion of the NATO summit in Chicago, the WPC would like to denounce once more the biggest war machinery in the history of mankind, which is responsible for crimes against humanity from its foundation in 1949 till today. NATO was never a defensive structure, not in 1952 when Greece and Turkey joined the “alliance” together and not during the existence of the Warsaw Pact, which was founded later than NATO and which was dissolved in 1991. NATO was kin and kindred to all bloody and reactionary regimes and counterrevolutionary movements in the world. Its governments and leaders were rolling red carpets to Pinochet and the Apartheid leaders, they were behind coups de’ Etat and military dictatorships in Latin America and Europe. 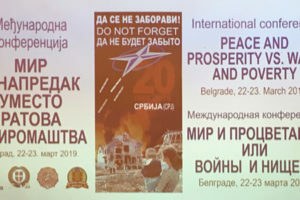 Especially after 1991 the peoples of the world faced the further growing of the aggressiveness of imperialism and of NATO, with its military interventions in the former Yugoslavia, which culminated in the 78 days of bombing in 1999. This was the first time NATO neglected openly not only the UN and international law, but also its own statutes, establishing the new doctrine that was approved at its summit in Washington, celebrating then its 50th anniversary. In the midst of the global economic crisis of capitalism, when millions of new people are getting impoverished even in the EU, the profits of the war industries are well off. Last year the total military expenses reached the record high of $1.54 trillion, half of it spent by the USA alone. The military budget adjustments in some of the NATO member states are related to the economic crisis and to a better coordination of their efforts, and have nothing to do with a peace-oriented approach of the governments. It is about “better value for money” so that the war machinery can be more efficient in order to persuade its “smart defense”. All governments of the member states share responsibility in NATO, regardless the leading role of the US administration. The whatsoever different approaches on some issues reflect particular views and rivalries, but they always lead to the common aggressive confrontation with the peoples. Unfortunately there were illusions also about the current US administration in regards and in comparison to the previous one. Life has proved that the Obama administration has not changed the slightest its imperialist policy and attitude, not towards the American capital and monopolies and their drive for more and more profits, and not towards its people and the peoples of the world. The aggression of the USA, France, the UK and NATO against Libya in 2011, this bloody massacre of the Libyan people in order to secure the oil reserves and the respective violent regime change, is absolute comparable with what the previous administrations did in Yugoslavia (Clinton), and Afghanistan and Iraq (G.W.Bush). It is obvious that nothing has changed; on the contrary, the US administration is leading, together with other powerful imperialist powers from Europe, the plans for the “Greater Middle East,” having today Syria as its target and tomorrow Iran. The WPC demands the unconditional and complete withdrawal of all US and NATO forces from Afghanistan, from Iraq, and from the Serbian province of Kossovo. The “peace and prosperity” can not be granted through protectorates and limitation of the sovereignty of the peoples, especially not under occupation. We demand to stop all kind of foreign interference in the domestic affairs of Syria and denounce the hypocritical concern of the imperialists towards the Syrian people. 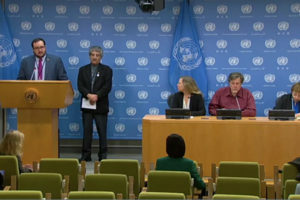 The WPC expresses its support to the people’s genuine demands for democratic social and economic changes in Syria and their desire for peace and stability. The desire and aspirations of the Syrian people have nothing to do with the armed mercenary groups sponsored, trained and instructed by Turkey, Qatar or Saudi Arabia, who are pushing Syria into a civil war. 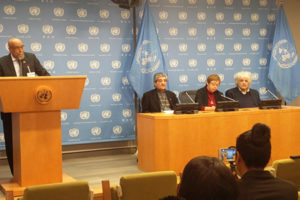 At the same time more and more sanctions are being imposed on Syria, which is leading to the suffering of its people. The WPC saw the situation on the ground during our recent visit to Syria. The people in Syria might be critical of many things in the political system, and for sure they have social-economic complaints and demands, but in no way do they accept foreign interference or military invasion to their country. The Syrian people don’t want another Libya, where, after the NATO massacre of last year, the country has been split off in parts and the tribes are killing each other. And who has the morals and courage to teach and export democracy to Syria by the way? Is it the Gulf monarchies? Why is nobody speaking in NATO all this period about the Saudi invasion into Bahrain? Who is able to teach the Arab peoples how to build democratic states, is it maybe the Greek governments who have, by the way, participated in all previous aggressions with US and NATO military bases on Greek soil, while the Greek people are getting impoverished by the common attack of the ruling forces, capital and the EU and the IMF? Two years ago (November 2010) NATO adopted its new military doctrine in Lisbon, making this military wing of imperialism more “effective” in dealing with its new plans and the so-called asymmetric threats. What they meant were energy security (which reads: how to get cheap oil and gas and control the pipelines), or piracy (how to secure the global capitalist commerce and transport of oil and gas), and of course the threats to democracy and stability in the societies (which means to build up authoritarian mechanisms of suppression against peoples’ uprising and protests). Hand in hand with the EU, NATO developed its war drive policies, and we had last year the comprehensive expression of the above with the military operations and bombings of Libya by NATO. NATO is expanding more and more its radius of operations, it has many forms of bilateral and multilateral cooperation, it is steadily involving partners into its plans. The G8 are safeguarding the interests of big capital and of the monopolies of their countries. Of course there are contradictions and fierce competitions. They are being carried out in the economic and political field throughout the year, for the share of the pie each of them will take. But when it comes to the annual summit the G8 has a common ground which goes clearly against the interests of the peoples, of the workers and peasants, of the vast majority of our societies. The decisions of what the IMF and the World Bank will do are being consulted in the G8, the balance between the different powerful imperialist forces are being dealt with in the G8. All G8 states, except Russia and Japan, are in NATO. Japan had troops in Iraq and is participating in the US military plans in Far East Asia. And Russia did not raise any veto last year at the UN Security Council when the bombing against Libya was to start. 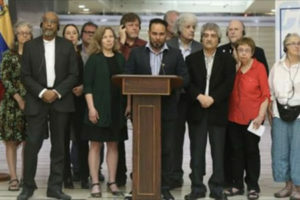 We are participating here in Chicago in continuation of the Lisbon people’s counter-summit to NATO, conveying our solidarity and our appreciation to the peace movement in the USA, which is struggling in difficult conditions against the same enemy. The $41 million which are being spent by the city of Chicago and the US government for the NATO summit are being cut directly from social services from the American people. NATO is meeting these days with its allies, more than 60 heads of state and governments will be in Chicago, converting this city into a fortress. NATO is going to discuss and concretize the doctrine approved in Lisbon, and already tested in Libya, in order to face its “new challenges”. They are speaking about “asymmetric threats” and establishing flexible NATO Response Forces (NRF) in order to intervene rapidly in any place where the interests of capital and the monopolies will be at stake. NATO is moving forward for its Missile Defense Shield, while they don’t refrain from a first-strike option. NATO is preparing and exercising for possible interventions inside its member states, since the discontent and anger of the peoples are growing, especially with the consequences of the capitalist crisis. When NATO speaks about safeguarding peace and security it means it is preparing new aggressions and wars against peoples and nations. NATO is making new reactionary plans hand-in-hand with the EU, which has established the European Army and its battle groups. All actions are well coordinated in order to suppress any protests and uprisings of the peoples, in order protect the flow of oil and the respective profits of the multinational corporations. They are speaking about new threats and dangers, non-military ones — like climate change, “cyberspace war”, energy security — demarcating the whole planet as their vital space of action. This includes Afghanistan, Somalia, Kossovo, the South China Sea or Australia and New Zealand. It includes the Middle East where plans are in full scale being developed. NATO’s aim is to become “more flexible, more effective and efficient” which means more murderous. The title of the NATO summit in Chicago “Peace and Stability in the Euro Atlantic area” is hypocritical, since NATO has already been acting as world police sheriff for many years. NATO is preparing its new Alliance Ground Surveillance (AGS) system with unmanned highly sophisticated airplanes for the surveillance of the Mediterranean Sea, which proves that the preparations for new aggressions are on their way. Under the title “Smart Defense,” NATO is trying to unify the military command structure of the member states, to set common priorities and save resources and expenses. NATO is demanding from its members to unify infrastructure and share responsibilities in multinational operations. All this goes also under the light of the budgetary problems the governments have during the capitalist economic crisis. There cannot be any peace and justice as long as imperialism will be dominating in the world. We call upon the peoples of the world to strengthen the struggle against imperialism in every country, to unite our voices and efforts for the dissolution of NATO and for the disengagement of our countries who are members of it. The global peace movement has to unite forces against the united effort of the capital and the monopolies, expressed for example by the G8. Imperialism is not all-powerful and for sure it is not invincible!